Playing a sport out in the bright sunshine can be a tricky task, not to mention a dangerous one if you’re struggling to see the ball during gameplay. With some sports sunglasses, you’ll be able to see clearly and get the protection you need. Here we tell you what to look out for in good sports sunglasses for men and what the best products are on the market right now. Depending on the sport you’re playing, there are different types of sunglasses that will be suitable. The colour of the lenses available varies, with brown tinted glasses being favourable for sports such as tennis as you can see the ball more clearly, and green lenses such as the Shade Men Nike Vision Terminus R Matte Seaweed being preferable to golfers because they reduce glare. If you don’t necessarily play one particular sport, brown or grey tinted glasses like the Zeal Optics Range Polarized Sunglasses are the best option for reducing glare. We’ve picked out some of the best sports sunglasses for men; take a look below for more details. Cyclists and runners love these sunglasses for their lightweight structure and barely-there feel. The filtered lenses work to block harmful UV rays and protect the eyes so you can see more of your surroundings. Despite their thin frames, users find them surprisingly durable and they are very resistant to general wear and tear; ideal for those who run or cycle daily. Their frame structure also makes them incredibly comfy to wear for long periods of time and the lenses will darken and lighten depending on the time of day and light levels so you’ve always got the perfect view. For those who play golf or tennis, these green tinted glasses are excellent for reducing glare on sunny and cloudy days. They have also been said to fit very well with a nice curve that is comfortable to wear all day – perfect for tournaments. They’re also said to be incredibly good for intense training as they’re durable and stay on well without causing discomfort around the ears. So whether you’re running track or just out for a jog, these glasses will ensure clarity every step of the way. These Under Armour sunglasses are said to be reliable for all types of sport. You can choose from grey, blue or orange lenses depending on what you’re using them for, and the lenses can be interchanged if you want to purchase more than one colour lens. You’ll get a handy carry case included to keep them safe and users say they are very durable despite feeling a little fragile. 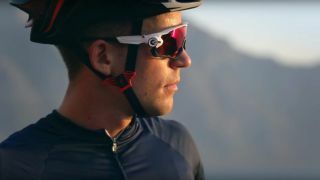 These are some serious sports sunglasses for men, and their Prizm technology is designed to alter the lenses depending on your environment so you get the best view possible. They also feature Switchlock lenses which can easily be interchanged with other Oakley lenses whenever you feel like it. Perfect for cycling or skiing, these sunglasses have a much wider field of view so you can see your periphery with ease. Golfers love these men’s sports sunglasses because their polarised lenses and wrap around arms make them feel like they’re not wearing anything at all. They are comfortable and the grey lens blocks all glare and rays for the perfect vision when on the course. The design is smart and stylish so these glasses can equally be worn out and about and are also good for driving in. A great budget buy for the style conscious golfer. These sunglasses are made from a natural plant-based resin which makes them super flexible and comfortable to wear. The nose pads are hypoallergenic, so if you find wearing glasses often irritates your face after a while, these could be a good pair to try, grey lenses make them a good all-rounder for any type of sport and also for everyday wear.